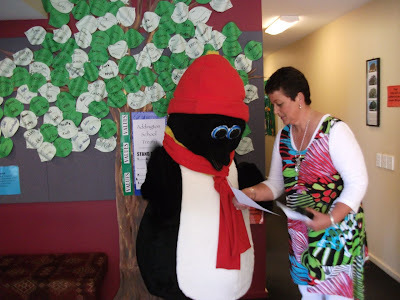 Pita and Ms Heath beside our School Treaty Tree checking out his enrolment. Pita the penguin has enrolled at Addington school! Pita joined the other new children at a special welcome ceremony recently. Pita, who had travelled all the way from Antarctica and appeared a little jet lagged, was very excited to be here, and was looking forward to learning all about the Addington Attitude and what makes an Addington Student so special! All the new children were given a welcome certificate, and the rest of the school sang the Welcome song. So far Pita has enjoyed visiting several of the classrooms and was hoping to go on either the Senior camp or the Year 4 camp later in the Term.